Sleep apnea presents at many different levels of severity, and has the potential to be a severely life-limiting condition, but many cases go undiagnosed. Approximately 9% of women and 25% of men in Australia have ‘clinically significant’ sleep apnea, while an additional 4% of both sexes are symptomatic. One estimation by healthy sleep experts suggests up to 80% of those suffering from sleep apnea in Australia remain undiagnosed. Sleep apnea can only be diagnosed by a medical professional, but after diagnosis, there are many different treatment options. Recommended treatment paths vary from individual to individual and will be influenced by the severity of the apnea and the overall health of the patient. Even those with the mildest forms of sleep apnea can find an improved sense of vitality with treatment. Afterall, we all know a good night’s sleep is one of the foundations of living a happy, productive life! While it may not completely cure sleep apnea, losing weight (if overweight or obese) can reduce the symptoms and provides many other overall health benefits. Alcohol is a muscle relaxant that can impede throat function even more. Reducing or completely elimination alcohol consumption may help lessen the effects of sleep apnea. For most people, sleeping on their back will exacerbate the effects of sleep apnea. This is due to the fact the tongue is more likely to fall back and block the throat in this position. For those with mild cases, simply changing to a side sleeping position may be the solution. Devices to stop back sleeping are available to purchase. Sewing a tennis ball into the back of a shirt also works! Having nasal congestion necessitates mouth breathing, which can lead to snoring and sleep apnea. Nasal congestion can be caused by many things including diet, medications, and anatomical obstruction. Speak to your health professional if this is an issue for you. CPAP involves attaching an air pump machine to the patient’s face for the duration of sleep, which effectively regulates breathing. This is widely acknowledged as the most effective way to stop the symptoms of sleep apnea. However, CPAP only stops the symptoms, it doesn’t cure sleep apnea. It can also be quite off-putting to some patients and their partners to have to bring a machine to bed every night. Specially made dental plates can treat sleep apnea by either helping push the patient’s jaw forward or holding the tongue in place. Both of these adjustments result in keeping the throat free from obstruction. These oral appliances are known by multiple names such as Mandibular Advancement Splints (MAS) or Mandibular Advancement Devices. As sleep apnea is commonly diagnosed with associated dental issues such as bruxism (teeth grinding), expertly designed oral appliances can address more than one health issue. 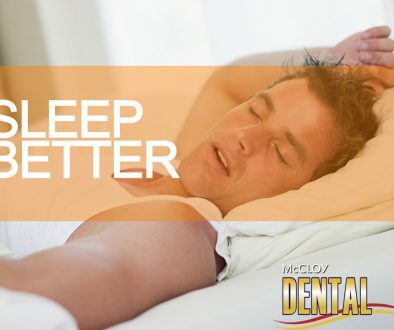 McCloy Dental have decades of dental experience, including the custom creation of oral appliances for use in the treatment of sleep apnea. Contact us today if you suspect you or a family member may be suffering from this condition and we will be happy to discuss possible treatment pathways in conjunction with your other health professionals. *Please note that any information given in this article is extremely general in nature and should in no way been seen as a substitute for individualised professional advice. The World’s Greatest Shave!!! Dental Veneers: All your questions answered.